The vast majority of children in Sandwell have a safe and happy childhood, free from fear, but for a vulnerable minority, childhood has quite a different meaning. 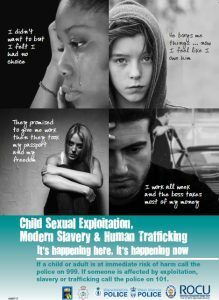 Local services and teams can take action to increase the ability of children and young people to realise they are being exploited and seek help. The Home Office has produced a range of resources, including a guidance booklet and posters. We encourage you to use these resources to help your staff understand the signs to spot potential victims and the action they should take to safeguard young people. Across the country, young people and vulnerable adults are being exploited by gangs to move and sell drugs on their behalf in suburban areas, market towns and coastal regions. This criminal activity is known as ‘county lines’, as young people travel to different regions where they’re unknown to the police and can therefore operate undetected. These young people can be as young as 10 and are often subjected to threats, violence, and sexual abuse by the gangs. To safeguard vulnerable young people from being exploited by ‘county line’ gangs, the Home Office is working with Crime Stoppers and the Department for Communities and Local Government to increase awareness among professionals who may encounter victims of the signs to spot and encourage staff to report their concerns to their safeguarding lead.